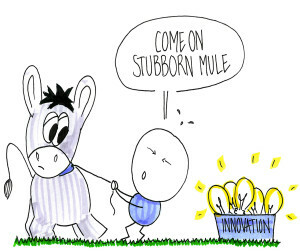 Should Everyone be involved in Innovation? Is it true that everybody should be involved in innovation projects? We’ve all heard the statement that “everybody is creative”, and you should “follow your passion” – but what if your passion is just to do your job? What if you, as an employee, just loathe to be involved in an innovation project? What if your deep-rooted belief is that “this is an absolute and complete waste of time”? You can of course put forward all the arguments about that innovation is a prerequisite for survival and so on. But you will, in any organisation, have a distribution of interest between, say, the 15% in one end of the scale (innovators and early adopters) will be ready for “anything innovative”, and the 16% in the other end of the scale that really don’t like to be involved in this (laggards). So what do you do? How can we leverage everybody’s energy? The last thing to do is to leave the laggards alone – but you shouldn’t try to force them either. One tactic is exactly to leverage the scepticism, and to include them in the projects as valuable, critical resources. Include the sceptics in your regular conversations, and let their voices be heard just as much as the optimists. Remember that one person’s wild dream is another’s nightmare – and both may be right! A people-oriented approach to achieving the mission and goals of an organization. With clear objectives and goals in mind, the facilitative leader supports active interaction between participants to make the most of their strengths, knowledge, skills and talents to ensure the best possible outcome. They encourage team members to contribute their insights, resourcefulness and expertise to study and analyze the situation, opportunity or issue. Facilitative leadership requires the leader to have a high degree of patience and be proficient in communication and social skills. Relative Advantage: The degree to which an innovation is perceived as being better than the idea it supersedes. Key Question: To what extent can I make the case that this new thing is better than what we have already? Compatibility: The degree to which an innovation is perceived to be consistent with the existing values, past experiences and needs of potential adopters. Key Question: How consistent (on a scale from 1 to 10) is this innovation with the values, experiences and needs of the potential adopter? Complexity: The degree to which an innovation is perceived as difficult to use. Key Question: How easy and relevant is it to use this innovation, and how many will use it? Trialability: The opportunity to experiment with the innovation on a limited basis. Key Question: To what extent are there opportunity to try out this innovation on a limited basis? Key Question: In what ways can the innovation be made tangible, understandable and clearly visible to others? We have facilitated numerous innovation projects, which you may read more about in our Testimonials section. We can facilitate an Innovation workshop, leveraged by idea generation, idea maturation, and concept development using Ideanote. We can facilitate an Innovation Culture project, to create a long-term leadership commitment to innovation. We can run an INNOCULTURE game session with you, where you learn about how to create leverage in your innovation projects buy addressing the most important issues first. We can run Innovation Camps, Innovation Events or Innovation Training, to kick-start and revitalise your innovation initiatives. We can create a FORTH Innovation project, with 8-12 selected participants, that create 2-3 mini business cases within 20 weeks.